One of the most important steps to diagnose a plumbing problem is locating the source of the sound. Similar sounds don't always mean the same plumbing problem. Because each appliance or pipe has unique parts and materials, similar sounds could mean different problems. Different problems require different solutions. If you hear whistling, vibrating, or shaking from the toilet, a loose fill valve could be the problem. If you hear banging in the laundry room, the pipes could be insecure in the walls and need refastening. Another potential problem is water hammer. When a stream of water travels down the narrow pipes of your home, it's traveling at a fast pace. As the water finds a closed valve — which was once a free-flowing escape from pipe to pipe — it creates an abrupt stop. The stop results in a loud thud and is due to an air chamber. Air chambers cushion water to prevent it from slamming against the pipe and damaging joints and connections. Most air chambers only exist in critical locations, like washing machines, where electric valves close rapidly. The hammering action against the air chamber that causes the loud thud is called a water hammer. To fix it, you need to replenish the air in every air chamber — not just the one that's closed. Shut off the main water supply valve to your home. Open the faucet that's located near the highest point in your house. This is usually on the second floor or in the attic. Turn on the faucet that's located near the lowest point in your house. This is usually on the first floor or in the basement. Turn off the lowest faucet and reopen the main water supply valve when the water is drained from the pipes. 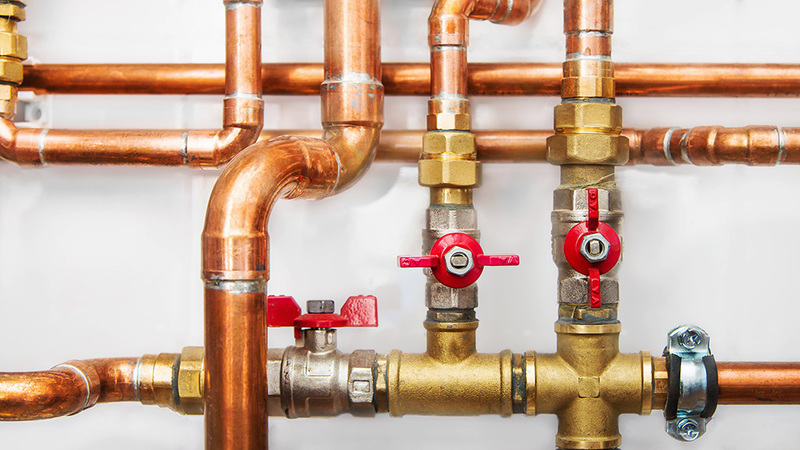 Water hammer occurs when water moves with too much force through the pipes. For more information about water hammers, read What a Hammering Noise Means for Your Drainage System. If you hear a quick whooshing noise during a shower, the plumbing problem is often mineral buildup (caused by hard water) in the pipes. If the sediment continues to grow, the pipes will clog and develop long-term problems. Use an eco-friendly drainage product or call a professional for plumbing maintenance. Another major source of noise in residential plumbing is the water heater. The water heater often rumbles during operation, especially if there is a sediment buildup at the bottom. Though similar to sediment buildup in the shower, this plumbing problem is easier to fix. Drain the water heater to remove sediment buildup from hard water. If you continue to experience plumbing problems with buildup, consider a water softener for the entire system. Check out The Benefits of a Water Softener in Your Home for more information. From toilets to water heaters, these appliances let homeowners know when a plumbing problem occurs. Listen carefully for whistling, vibrating, shaking, and banging. Do you hear strange sounds when you’re running water in your home? Even though these can be annoying, plumbing noises can actually be used to diagnose issues that may be hiding in your pipes. By listening to these noises and learning what they mean, you can even discern if you can fix the issue yourself or if a professional plumber is needed. First, one of the most important steps in diagnosing your plumbing system is locating the source of the sound. Similar sounds in different areas are usually completely different issues. This is because each appliance that uses plumbing has different parts to make it operate properly. These parts are unique and age differently, meaning different services will be needed to fix the issues. First, if the noises you are experiencing are coming from your toilet, the issue is likely the fill valve. Sounds you may hear include a whistling and a vibrating or shaking noise. The whistling can actually be heard in other areas besides the bathroom, but a loose fill valve is almost always the cause. Luckily, this is an issue that can be easily fixed by you at home! Simply remove the toilet lid and adjust the fill valve on each toilet until the whistling is resolved. Next, if you are hearing vibrating in your bathroom the diagnosis is even easier. All you have to do is examine the fill valve on the toilet that is making the noise. Then, lift the valve and test the toilet. If the vibrating has stopped, you have found the issue. Unfortunately, this means that you also need a new fill valve mechanism to fix the noise. If it is your pipe system itself that is making the noise, especially when using a faucet or shower, then follow these steps. First, determine the sound. If your pipes are producing a banging noise (usually in the laundry room) then there are two possibilities. First, your pipes could be unsecured from the walls, meaning that they will need to be re-fastened. A professional should look at these issues to ensure that damage has not occurred to either the pipes or your walls. Second, an issue may be what is called “water hammer.” Water hammer occurs when water moves too forcefully through your pipes. When water is transported through your house, it can cause up to 10 pounds of pressure to the inside of your pipes. In addition, when a laundry machine is using the plumbing, it draws the water in quick bursts, meaning the pipes may shake as the bursts travel through them. When the pipes shake, they produce a quick and loud noise like a hammer, which is where the term “water hammer” originates. This issue can be fixed by installing a water hammer arrestor, which will help equalize the force the water produces. If you hear a quick “whooshing” noise in your piping when you run a shower, the issue is often mineral buildup (often caused by hard water) in the pipes. While this is not damaging in small amounts, if the sediment continues to grow pipes will become clogged more easily and your pipes will begin to develop issues. It is best to either use a pipe cleaning solution or have a plumber professionally clean your pipes. Finally, the last major source of noise in your plumbing is often your water heater. The water heater often rumbles while operating if there is a buildup of sediment in the bottom. This is similar to the buildup in the pipes, but can be more easily fixed. By simple draining your water heater, you can remove the sediment and the problem is solved! If you continue to experience issues with buildup, a water softener may be beneficial to your plumbing system. Warner Service knows that there can be many issues occurring in your pipes, and it is difficult to diagnose exactly what is wrong with them. If you are experiencing plumbing issues, call Warner Service today to have a professional plumber examine your individual system and fix your issues quickly and easily.